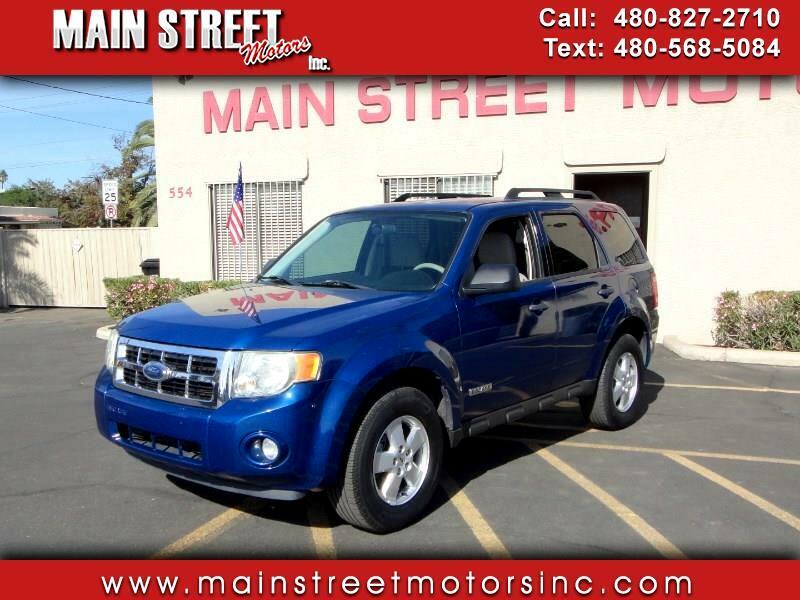 Buy Here Pay Here 2008 Ford Escape XLT 2WD I4 for Sale in Mesa AZ 85201 Main Street Motors Inc. This clean Escape XLT is a one owner, local Mesa SUV. It is fully loaded including power driver's seat, CD stereo, automatic headlights, fog lights, traction control, anti-lock brakes, roof rack, alloy wheels, and near new tires. This little SUV runs and drives great. The body has no dents or damage, and the paint is glossy with only a few scratches and some minor fading. The cloth interior is clean with no rips or abuse. Everything works properly, and it even has the owner's manual. If you are looking for an economical SUV, stop in and see this clean Escape. All of our vehicles have been completely serviced and inspected by our mechanic. All vehicles come with a 60 day or 2000 mile warranty on the engine and transmission. We offer in-house, buy here - pay here, financing for those with credit challenges. Visit our website at www.mainstreetmotorsinc.com to see more photos of this vehicle and all our inventory. Call us at 480-827-2710 with any questions. All vehicle prices are plus sales tax, title fees, license and registration fees, emission test fees, deal documentary fee, and financing. We are not responsible for any errors or omissions by internet web site provider. Se Habla Espanol, ask for Jesus. You promise to pay us the principal amount of $5,695.00, plus a time price differential accruing on the unpaid balance at the rate of 19.90 % per year from today's date until maturity. The time price differential accrues on a 365 day basis. After maturity, or after you default and we demand payment, we will earn finance charges on the unpaid balance at 19.90 % per year. You agree to pay this Contract according to the payment schedule and late charge provisions shown in the TRUTH IN LENDING DISCLOSURES. You also agree to pay any additional amounts according to the terms and conditions of this Contract. All prices are plus taxes, title and license fees, dealer documentation fee, emission fees. Dealer is not responsible for any errors or omissions by web site provider.